Hank Snow, born Clarence Eugene Snow (May 9, 1914 – December 20, 1999), was a Hall of Fame country music singer and songwriter. Canadian born and known as the "Singing Ranger," Snow came to Nashville in the late 1940s and scored a number one country hit with "I'm Movin' On," which remained at the top of the country charts for nearly six months and became his signature song. Another hit which won him lasting fame was "I've Been Everywhere." Both songs have been widely covered by stars from Johnny Cash to the Rolling Stones. In 1954, Snow influenced the directors of the Grand Ole Opry to allow him to use the rising rockabilly star Elvis Presley as an opening act. Presley was not invited back, but Snow would briefly partner with Col. Tom Parker in managing him. 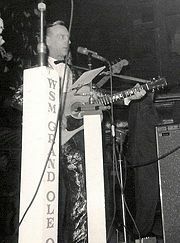 Snow was a popular star at the Opry, and had a long and successful career, scoring his seventh number one hit at the age of 59, the oldest person to reach number one up until that point. He had 43 singles that reached the top 10 and sold more than 80 million albums. Snow was born in Brooklyn, Queens County, Nova Scotia, Canada. When he was 14, he ordered his first guitar from Eaton's catalog for $5.95, and played his first show in a church basement in Bridgewater, Nova Scotia, at the age of 16. Like many other future country stars, he was strongly influenced by the recordings of Jimmy Rogers and learned how to sing, yodel, and play in his style. He worked on the fish docks and farms while perfecting his singing and guitar skills, which he used to entertain friends. He then traveled to the nearest big city, Halifax, where he sang in local clubs and bars, billing himself as the "Yodeling Ranger" and forming his Rainbow Ranch Boys band. A successful appearance on a local radio station led to his being given a chance to audition for RCA Victor in Montreal, Quebec. In October of 1936, he signed with RCA Victor, staying with them for more than forty-five years. A weekly Canadian Broadcasting Corporation (CBC) radio show brought him national recognition, and he became a popular recording artist and touring performer in Canada until the late 1940s, when American country music stations began playing his records. He then headed to the "Country Music Capital of the World," Nashville, Tennessee. Changing his name from the "Yodeling Ranger" to the "Singing Ranger," he was invited to play at the Grand Ole Opry in 1950. That same year he released his mega-hit, "I'm Movin' On." The first of his seven number one hits on the country charts, "I'm Movin' On" stayed at number one for nearly half a year. Along with this hit, his other signature song was "I've Been Everywhere," in which he portrayed himself as a hitchhiker bragging about all the towns he had traveled through. This song was originally written and performed in Australia, and its re-write incorporating North American place names was brilliantly accomplished. Rattling off a well-rhymed series of city names at an auctioneer's pace has long made the song a challenge for any country-music singer to attempt. A regular at the Grand Ole Opry, in 1954,, Snow persuaded the directors to allow a new rockabilly singer by the name of Elvis Presley to appear on stage. Snow used Elvis as his opening act, before introducing him to Colonel Tom Parker. In August of 1955, Snow and Parker formed the management team, Hank Snow Attractions. This partnership signed a management contract with Presley but before long, Snow was out and Parker had full control over the rock singer's career. In 1958, Snow became a naturalized citizen of the United States. Performing in lavish and colorful sequin-studded suits, Snow had a career covering six decades, during which he sold more than 80 million albums. Although he became a proud American citizen, he still maintained his friendships in Canada and remembered his roots with the 1968 Album, My Nova Scotia Home. He was elected to the Country Music Hall of Fame in 1979, and died in Madison, Tennessee, in the United States, on December 20, 1999. He was interred in the Spring Hill Cemetery in Nashville. Despite his lack of schooling, Snow was a gifted songwriter, and in 1978, was elected to Nashville Songwriters Hall of Fame. In Canada, he was ten times voted that country's top country music performer. Besides being elected to the Country Music Hall of Fame, he is also a member of the Canadian Music Hall of Fame, the Nova Scotia Music Hall of Fame, and the Canadian Country Music Hall of Fame. In 1994, his autobiography, The Hank Snow Story, was published, and later, The Hank Snow Country Music Centre would open in Liverpool, Nova Scotia. The victim of an abusive childhood, he set up the Hank Snow International Foundation For Prevention Of Child Abuse. Elvis Presley, The Rolling Stones, Ray Charles, Ashley MacIsaac, Johnny Cash, and Emmylou Harris, among others, have covered his music. One of his last top hits, "Hello Love," was, for several seasons, sung by Garrison Keillor to open each broadcast of his Prairie Home Companion radio show. The song became Snow's seventh and final number one hit on the Billboard Magazine Hot Country Singles chart in April 1974. At 59 years and 11 months, he became the oldest (at that time) artist to have a number one song on the chart. It was an accomplishment he held for more than 26 years, until Kenny Rogers surpassed the age record in May 2000, (at 61) with "Buy Me a Rose." Wolfe, Charles. "Hank Snow." In The Encyclopedia of Country Music. Paul Kingsbury, editor. New York: Oxford University Press, 1998. Hank Snow Country Music Center www.hanksnow.com. At the Country Music Hall of Fame www.countrymusichalloffame.com. This page was last modified on 26 July 2017, at 16:37.